Your online store to sell to anyone, anywhere, 24 hours a day. Together we can increase your business opportunities and your sales. The markets have changed. Customers now have at their disposal many more tools and resources to help them during their decision-making and purchasing processess. The Sales Teams are struggling more than ever to close deals and find business opportunities without a real, practical and reliable support guaranteed by a direct online marketplace. We can definitely help you overcome these challenges and turn them into great opportunities. In the Digital era every effort should help to strengthen your online image and sales opportunities. Effective eCommerce websites + Marketing. In Brook we firmly believe that both effective websites and winning eCommerce solutions present a combination of attractive design, solid technology and integrated web marketing. We help eCommerce and retail businesses to fully embrace their digital opportunities, from marketing to emails, from automations to newsletters, guided shopping to public relations, social media to online customer support. 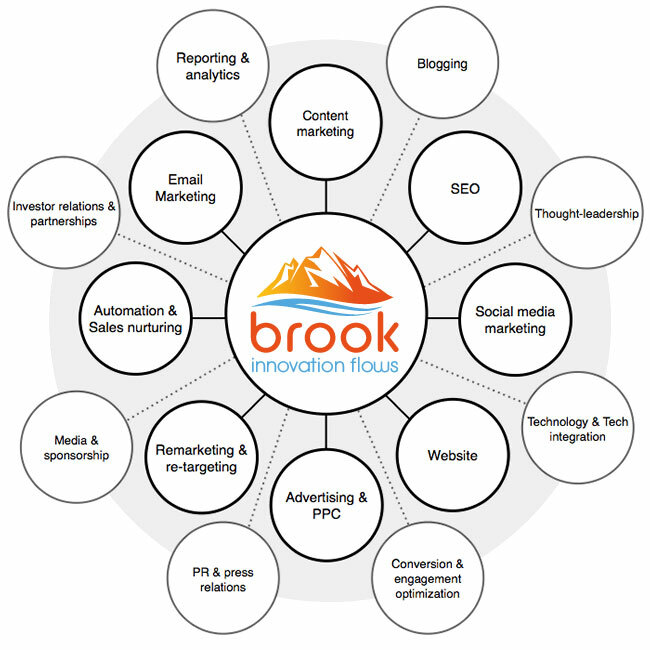 Brook is a full-service digital agency that accompanies the customers towards their business goals using innovative marketing strategies from the multi-channel to inbound, organization of events and guerrilla marketing. We provide marketing solutions based on real data, designed to convert your existing customers, attract new ones and optimize your entire web communication for success.